Evelyn Salt is a CIA agent and highly respected by all, including her boss, Ted Winter. Out of the blue, a Russian spy walks into their offices and offers a vital piece of information: the President of Russia will be assassinated during his forthcoming visit to New York City to attend the funeral of the recently deceased U.S. Vice President. The name of the assassin: Evelyn Salt. Peabody: How many more like you are there? Salt: Like me? None. Like him? More than you or I can handle alone. Do you need a bit of salt here? Yep, preferably with large grains, because you need that when you watch this movie. Do not expect a realistic movie, because then you’ll be disappointed. 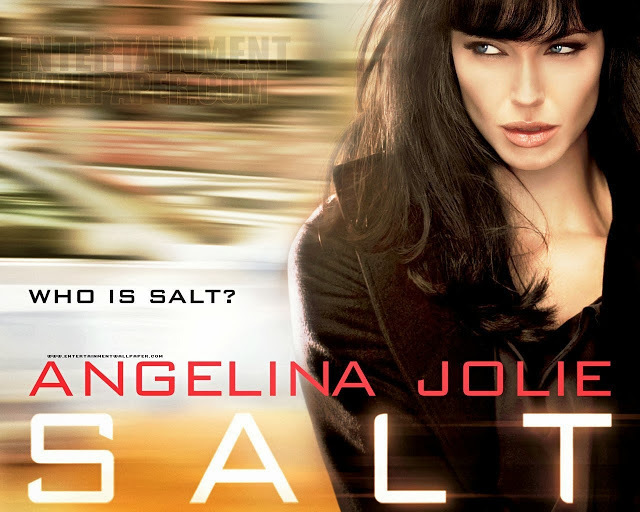 “Salt” is a excellent spy action movie that rages like a TGV. 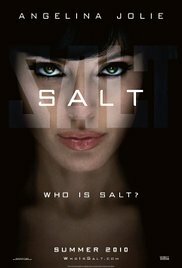 From the moment Salt is accused of the fact that she is a Russian spy who has been specially trained by some Russian extremist who has devised a master plan to give orphans a U.S. education and then send them to the U.S. to wait for “Day X” after which they each perform their specific job, it all goes very fast. Before you know it, you’ve been watching this movie for half an hour. The action scenes are masterfully portrayed and follow each other in rapid succession. Some scenes are a bit over the top and hard to believe. The jumping from one truck to another makes you scratch your head after a while. The floating down in an elevator shaft looks awful and ridiculously unrealistic. As Salt supposedly eliminates the Russian president, she’s removed from there in a police car with two extra patrol cars. I think in reality, half the U.S. military would accompany her. The part where she manipulates the driver with the taser to accelerate and steer is hopelessly laughable. And then there is the remarkable fact how she recovers after several terrible blows and hits, and then starts running again like a trained Olympic athlete. Besides, I do think that if Angelina Jolie would participate again in another action movie that involves scenes where she has to run a lot, she better takes a personal trainer to teach her a bit more running techniques. At times she looks like a running broomstick with huge weights on her ankles . I’m not a big Angelina Jolie-fan. Yes she has a certain charisma and yes she has a wonderfully sensual look in her eyes. But more than once I caught myself with the thought that she would be sticking to a wall with those big lips of her, after being smacked against it by an opponent. In fact she really looked like a walking anorexic patient and actually asked myself how the hell she could handle those tough trained guys. In reality, she would be crushed like an annoying fly. The story on its own is incredibly predictable and totally innovative. Even the sabotaging at the last moment of a nuclear attack has been used ad nauseam. Also the fact that her partner Ted is a result of the Russian breeding ground is something you also saw coming a mile away. The only plot twist that was in this movie was when she planted the broken bottle in the Adam’s apple of Orlov. Until that very moment I was sure that she was indeed a spy. Liev Schreiber didn’t make a smashing impression. The whole movie he was a paragon of measured coolness with a pronounced stoic expression on his face. All in all a relaxing action movie with a thin story and improbabilities that blows you away. I only found the end actually brilliant and an outspoken open end to make a sequel. And according to IMDb it’s already in the making. For me definitely a film you can’t skip.